This is the long version, which I should have posted months ago and didn’t realize was missing from the website. 1. Heat the milk. To kill off any bad bacteria, and to break apart the casein proteins in the milk so the yogurt will gel more easily, boil the mill until it foams and rises. To retain the complete enzymes and bacteria of raw milk, heat the milk to your desired temperature. Remove from heat. 2. Let milk cool until it reaches 120°F. I use my fingers – when I can stick my fingers in the milk for 2-3 seconds until it’s too hot, then it’s ready. Inoculate the milk with live active cultures. This means, mix in about 2 T of yogurt for each quart of milk. Mix a small amount of milk with the yogurt, whisk well to remove any lumps, and then stir this yogurt mixture back into the warm milk. 3. Pour this inoculated milk into your incubating container. This should be some sort of glass or ceramic container with a top – it is not necessary for the top to be airtight, so you can simply set a plate over the top of a bowl if you like. Wrap your yogurt in dish towels and place over the pilot light of your stove. Heat hot water, pour it into a cooler, place yogurt in the hot water, and close the top of the cooler. Wrap the yogurt in an electric blanket or heating pad. Heat a pizza stone, place it in a warm oven, put your yogurt in, and close the door to retain the heat. During the summer, it may be possible to make yogurt by just leaving the jar on the kitchen counter, perhaps in the sun, for longer than 10 hours. Be patient – I have met a few people on this trip who incubate their yogurt at a lower temperature for 24-48 hours. 5. Once your yogurt has reached its desired consistency, place it in the refrigerator and keep it chilled for a couple of weeks. It will leak whey and become more sour as the days pass, but that doesn’t mean it’s gone bad. 6. 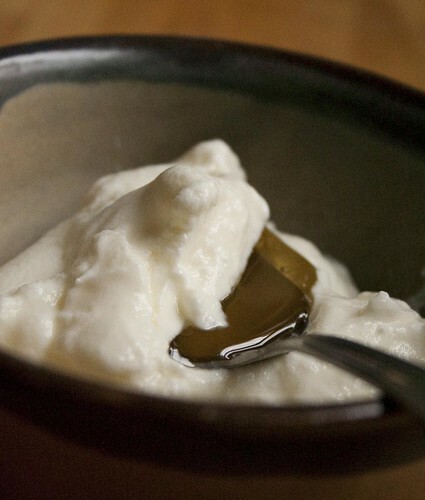 To learn about straining yogurt, read this post. Check out new teaching materials on the “Yogurt? How?” page! How do you strain yogurt, you may ask, and why go to all the trouble? Because strained yogurt is thicker, creamier, and less acidic. Being familiar with straining yogurt also means you have incredible control over the texture of your yogurt. Also, you have lots of whey to play with. Whey is the liquid that drains out of the yogurt when you strain it. It’s also the slightly greenish liquid that separates from yogurt you buy at the grocery store. It’s pretty acidic, and it has a lot of lactose in it, but it’s also full of great nutrients, so don’t throw it out! At the farm in France, we gave whey to the pigs – because of its high acidity, it was hard to get rid of it any other sustainable way, and pork from pigs fed with whey have a delicious, distinctive taste. At home, keep the whey in your fridge until the next time you cook chickpeas, rice, or other dried beans, and soak them in the whey overnight instead of using water so they absorb all of the nutritious goodness. Some people even drink whey straight, but I have yet to be so bold. How do you strain yogurt? Get a sieve, and a bowl that fits nicely under the sieve with a decent amount of space under the bottom of the sieve, and some cheesecloth. 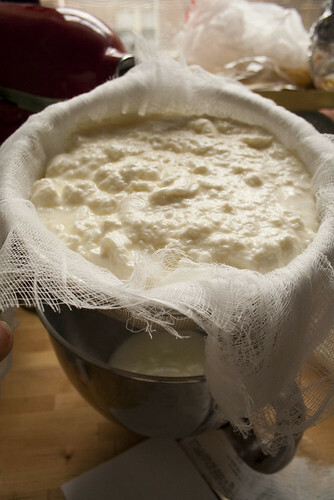 Place a few layers of cheesecloth in the sieve, pour the yogurt in, and wait. There’s no real science here – just let it sit (in the fridge, or at least keep an eye on it so it doesn’t get warm and spoiled) until the yogurt is the texture you want. The batch of yogurt pictured here (made from milk from Keith Parrish’s Farm – South Pork Ranch, LLC in Chatsworth, Illinois, which had a strong, grassy smell that Dena liked much more than I did) I had an especially hard time getting firm to my liking, so I popped the whole thing in the strainer, just for about 45 minutes until it was the thick consistency I like over my morning granola and fruit. You can keep going, and it turns into a spreadable yogurt cheese, what they call labne in Turkey. 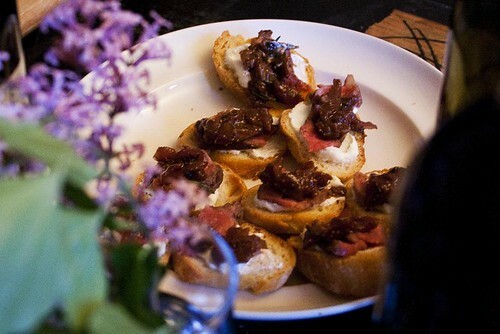 It’s what I spread on these delicious crostini I made for a recent dinner party, and what I also like to do occasionally as a change from yogurt over granola every morning – spread yogurt on some toast with honey or jam.